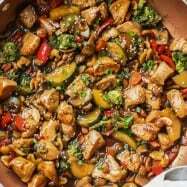 This chicken and veggie stir-fry satisfies even the fiercest craving for takeout. 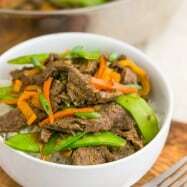 Stir fry’s are a great choice for a busy weeknight. They are quick and easy to make and you can use a variety of veggies to keep things exciting. I suggest you prep all your veggies before you fire up the stove. Once your veggies are chopped, this takes less than 15 minutes to cook. 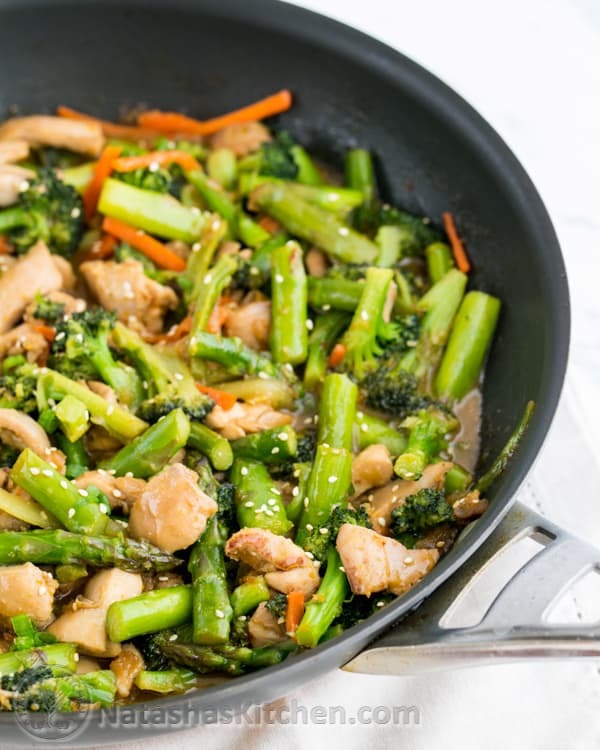 This stir fry is packed with broccoli, asparagus and plenty of juicy chicken. You can use light or dark meat for this, but I prefer chicken thigh meat which is more flavorful and tender. My son lovingly calls this “Panda.” My guys gobbled it up and asked for re-fills. I hope your family loves it too! 1. 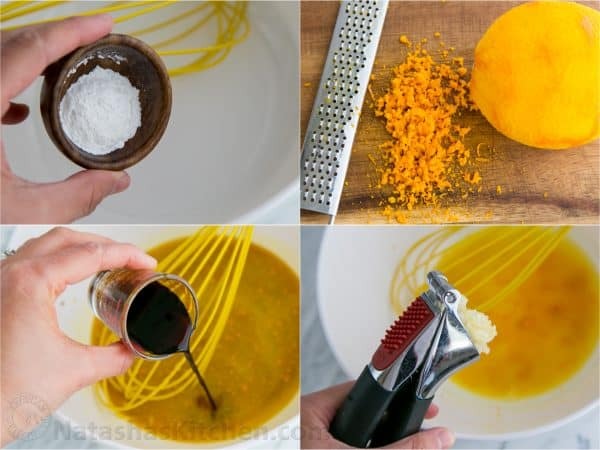 In a bowl, whisk together the 1/4 cup cold water and 1/2 Tbsp starch, then whisk in the rest of the Marinade Ingredients: 1/2 Tbsp orange zest, 1/2 cup fresh OJ, 4 Tbsp soy sauce, 2 tsp sesame oil, 1 Tbsp grated fresh ginger, 3 minced garlic cloves and 2 Tbsp honey. 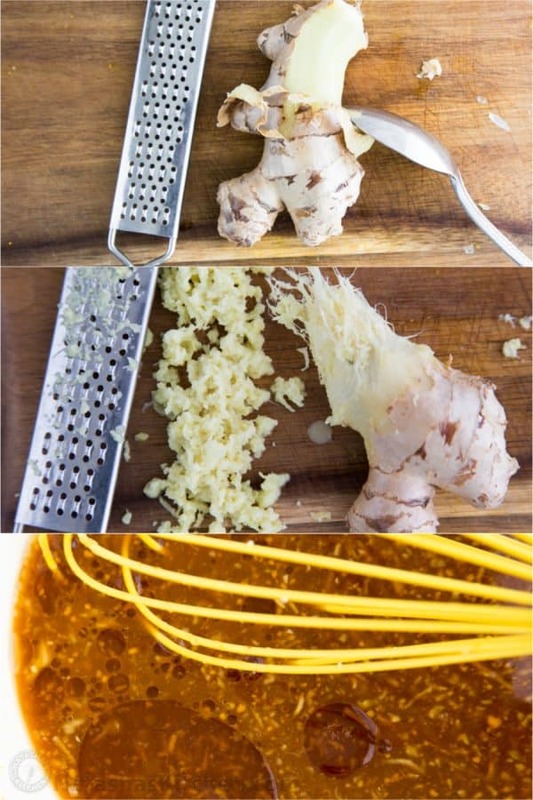 Here’s a tip: Peel your ginger with a spoon. It comes off really easily! 2. Add 1/4 of your marinade to your prepared chicken thigh meat, stir and let it marinate while preparing the rest of your veggies (15-30 min). 3. Heat a large wok or heavy-bottomed saute pan over high heat. Add 1/2 cup water. 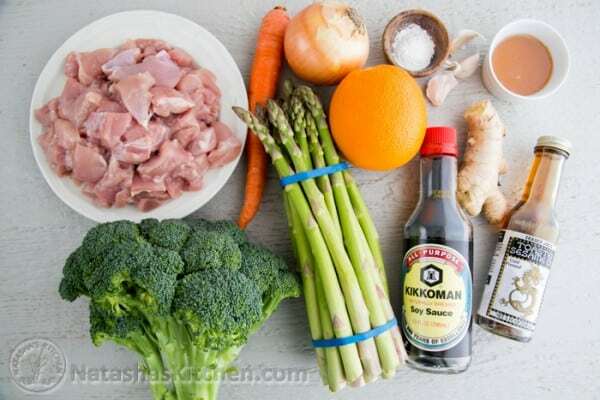 As soon as it boils, add broccoli, carrot and asparagus. Cover and let it steam cook for 2 minutes over high heat until the veggies are crisp tender and bright green. 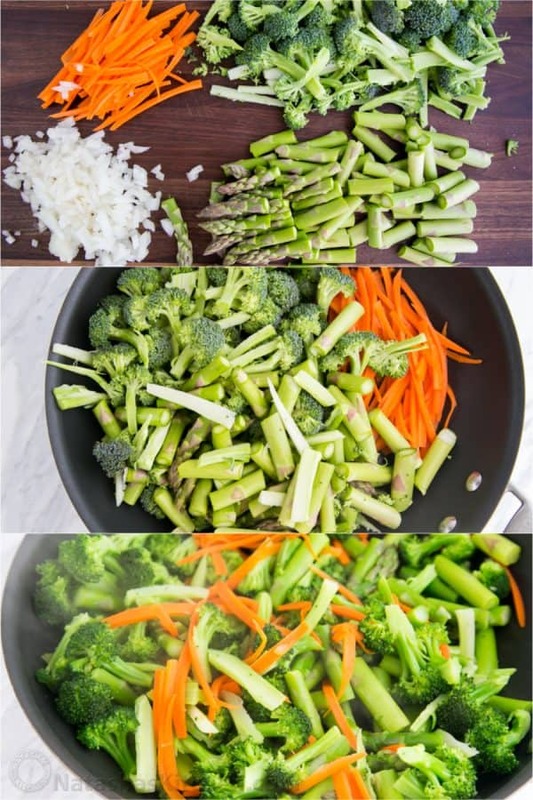 Remove veggies to a bowl then rinse and dry your pan. 4. Again, heat the pan over high heat and stir in 1 1/2 Tbsp oil. 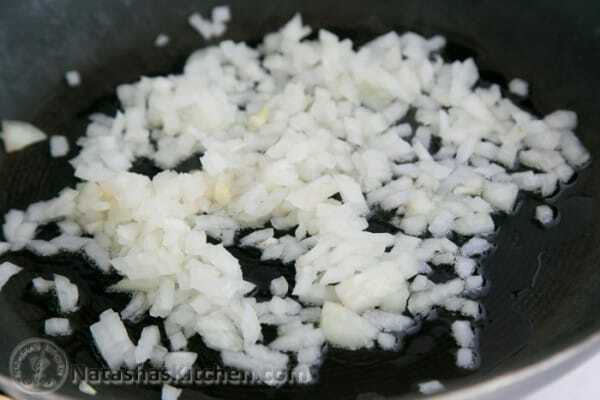 Add diced onion and saute 1 minute, stirring constantly. 5. Add the marinated chicken to the hot skillet in a single layer. Let the chicken sit untouched for 2 minutes until browned, then stir to brown the other side. Once chicken is almost cooked, add the reserved marinade and simmer 3 minutes or until sauce thickens. Stir in the vegetables and continue to cook another minute. Chicken should be fully cooked. Sprinkle with toasted sesame seeds and serve over hot rice. 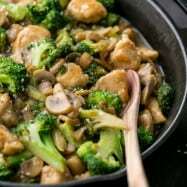 This chicken and veggie stir-fry satisfies even the biggest craving for takeout. It's also really easy and quick to make. 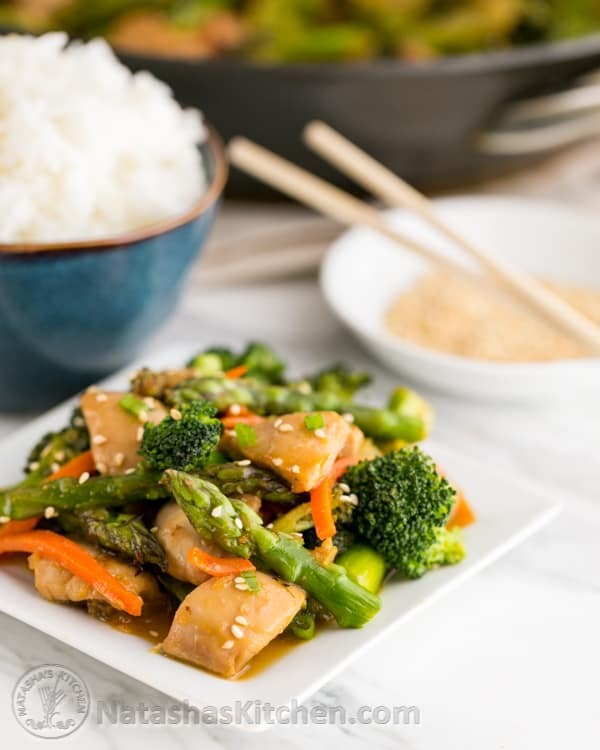 This stir fry is packed with broccoli, asparagus and plenty of juicy chicken. You can use light or dark meat chicken for this, but I prefer chicken thigh meat which is more flavorful and tender. 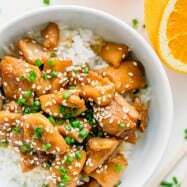 In a bowl, whisk together the 1/4 cup cold water and 1/2 Tbsp starch, then whisk in the rest of the Marinade Ingredients: 1/2 Tbsp orange zest, 1/2 cup fresh OJ, 4 Tbsp soy sauce, 2 tsp sesame oil, 1 Tbsp grated fresh ginger, 3 minced garlic cloves and 2 Tbsp honey. Add 1/4 of your marinade to your prepared chicken thigh meat, stir and let it marinate while preparing the rest of your veggies (15-30 min). Heat a large wok or heavy-bottomed saute pan over high heat. Add 1/2 cup water. As soon as it boils, add broccoli, carrot and asparagus. Cover and let it steam cook for 2 minutes over high heat until the veggies are crisp tender and bright green. Remove veggies to a bowl then rinse and dry your pan. Again, heat the pan over high heat and stir in 1 1/2 Tbsp oil. Add diced onion and saute 1 minute, stirring constantly. 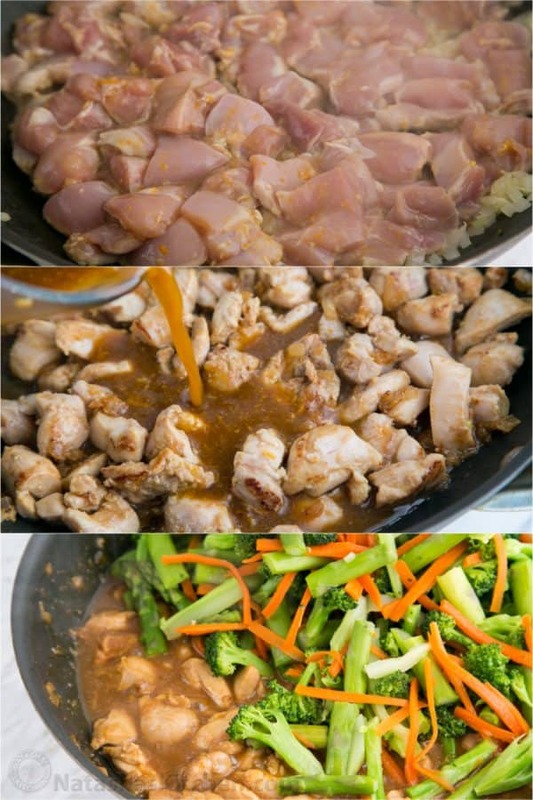 Add the marinated chicken to the hot skillet in a single layer. Let the chicken sit untouched for 2 minutes until browned, then stir to brown the other side. 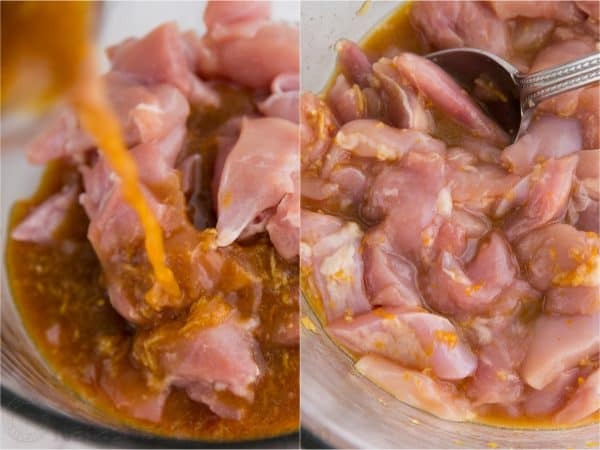 Once chicken is almost cooked, add the reserved marinade and simmer 3 minutes or until sauce thickens. Stir in the vegetables and continue to cook another minute. Chicken should be fully cooked. Sprinkle with toasted sesame seeds and serve over hot rice. Tips for success: Peel your ginger with a spoon. It comes off really easily! 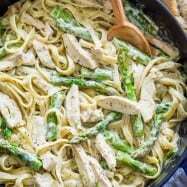 Making this tomorrow night and can’t wait to try it. Since it’s just me, I usually spend Saturday cooking three different entrees and potion out a week’s worth of healthy lunches and dinners. I just discovered your blog , putting it on my side bar.. I made this dish last night according to your recipe…not sure why but it had some bitterness to it and although I could taste the freshness of ginger, I was missing something…any idea what could have gone wrong or is it supposed to taste a little bitter? Could it be the orange zest (I was careful though not to grate any of the white layer underneath the skin)? Hey Natasha….you r so preety and slim. I liked this recipe n ready to print. 7. 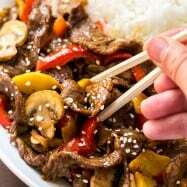 Sprinkle with toasted sesame seeds and serve or hot rice.